Nobuko Miyamoto. Photos by Baii Nguyen. From underneath a mountainous pile of disposable wooden chopsticks, the face of a pale and sprightly woman pops up, a lone pair of sticks gripped between her teeth, and, through her bun of gray and white hair, chopsticks jabbed in all directions. So begins the music video for "B.Y.O. 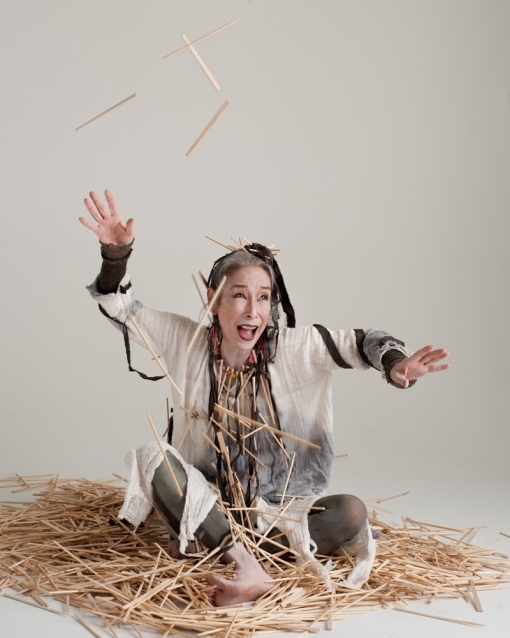 Chopstix," the first in a series of songs written and performed by Nobuko Miyamoto to address environmental issues and greener living. The Ghost of Dead Chopsticks, the video’s central character played by Miyamoto, haunts the patrons of a Japanese restaurant. Draped in wooden chopsticks, the ghost playfully steals pairs of chopsticks or slices of sashimi from the lips of unwitting customers. Rapper Aidger of Aesthetics Crew plays the sushi chef, wielding knives, peddling portable chopsticks from inside his chef’s coat. His rhymes form the song’s main message: “Hundreds of years of history chopped down/Into these billions of sticks that just get tossed to the ground.” With a catchy beat, campy sense of humor and inventive special effects, the video sheds light on the ways in which disposable chopsticks contribute to deforestation and air pollution and offers practical suggestions to reduce their use — all without negating the joy of eating our favorite foods with our utensil of choice. Miyamoto, 66, first started toting her own portable pair of chopsticks to Asian restaurants near her home in Los Angeles back in 2000. The chopsticks — found at Snow Peak, an outdoor camping equipment company — have wooden tips made from recycled baseball bat material and stainless steel ends. They unscrew at the center, making them small enough to fit in your pocket. Sometimes Miyamoto's chopsticks attracted strange looks from staff and neighboring patrons, but they also sparked curiosity and conversation about the environment and waste reduction. Pretty soon, Miyamoto began gifting portable chopsticks to friends, making colorful fabric carrying cases to accompany them. 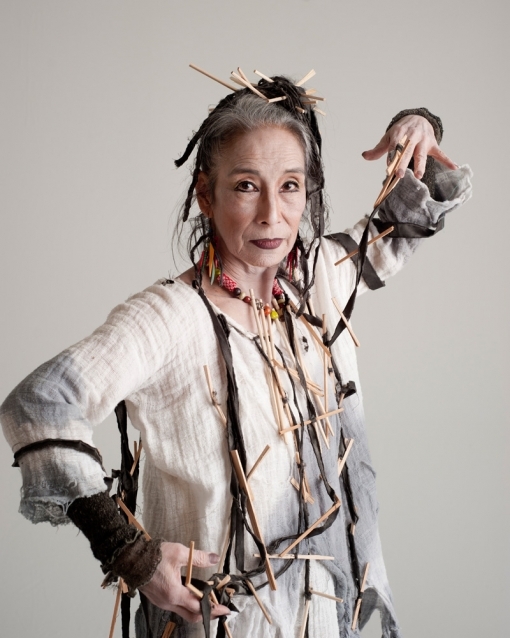 Great Leap, the cross-cultural arts organization that Miyamoto founded in 1978 where she also serves as artistic director, offers reusable chopsticks for sale. According to myhashi.org, the website of a Canadian campaign for portable chopsticks, nearly 90 percent of the industry's disposable chopsticks are produced from clear-cut forests in China. These chopsticks are consumed at a greater rate than their production — trees just don't grow that fast — and in 2006, China imposed a tax specifically on disposable chopstick exports to address the problem. While disposable chopsticks can be composted, and a few enterprising souls make and sell products like lamps and baskets made from sanitized disposable chopsticks, the vast majority of sticks end up in the trash. Miyamoto wasn't the first to take notice of the problem, but after participating in the Council for a Parliament of the World's Religions in Melbourne in 2009, where discussions emphasized the urgency of the environmental crisis, she began to seriously consider how she could help. She was also moved by listening to Australian aboriginals: "Indigenous people realize that they have been caretakers of this Earth. It is time for this voice to return." Drawing on the Buddhist teachings of Thich Nhat Hanh and the work of Nobel Peace Prize winner Wangari Maathai, Miyamoto emphasizes the interdependence of all living beings. "This little hashi is just an entryway to see how all things are connected," she said. "It's not just a piece of wood anymore. It's the future, it's the air you breathe." While her call to action is addressed to everyone, Miyamoto feels that the issue resonates for Asian Americans in particular, giving them a concrete way to be involved in the environmental conversation. Miyamoto cites the enormous influence Asian culture has had on American food culture. "We have made an impact that people don't even realize, and it's a groovy thing," she said. Miyamoto hopes to extend that impact to restaurant owners by getting them to consider switching over to bamboo chopsticks or, better yet, reusable ones. The latter is less likely: customers are used to the aesthetic look as well as perception that waribashi are more hygienic, and some view plastic chopsticks as cheap or dirty. To spread her message, Miyamoto is collaborating with young members of the Japanese American Citizens League in L.A. to hold discussions at local restaurants to educate patrons on the issue. They want these newly minted activists to present sustainable waribashi or plastic chopstick alternatives to the owners of restaurants that they frequent. This is exactly what she did at Azuma, the Gardena, CA, restaurant where "B.Y.O. Chopstix" was filmed. For owner Hideki Obayashi, helping the environment sounded like a nice idea but in trying economic times, cost effectiveness was the bottom line. Obayashi had been using both wooden and bamboo chopsticks, alternating between lunch and dinner. Bamboo chopsticks were approximately 5 percent more expensive than the wooden ones, but he bargained the price down with his distributor in exchange for a doubling of his order. He pointed out that the bamboo chopsticks, although darker in color, have the added benefit of being smoother and rounder and have received no complaints from customers. You don't have to pull them apart and rub them together as though you are about to start a fire because they don't carry the splintery hangnails that the wooden sticks often do. Miyamoto's campaign is, however, about more than just the number of restaurants and consumers using chopsticks made from more sustainable materials; she wants to change our entire mindset around consumption and waste. The day we met, Miyamoto had just come from the recording studio working on a second song, "Mottainai," also the title of the song series. It’s a Japanese word that translates literally to "wasteful," but colloquially and culturally it conveys much more. it truly makes me feel bad. Miyamoto describes mottainai as "an idea of returning to a way of living that puts some limits on us. 'Yes I could have this, but do I need it?' "
So what's the connection between Miyamoto's chopstick activism and her art? For her, it's simply a matter of applying her boundary-pushing artistic sensibilities to another realm of activism. "Artists can shift people's consciousness," she said. "To me, that's the beginning of creating change." The "B.Y.O. Chopstix" and “Mottainai” videos will be screened alongside an original choreographed dance for World Environment Day on June 5 at the Japanese American National Museum, as well as at 15 L.A.-area Obon festivals this summer. To find out more information on your area Obon festival, please contact the Rev. William Briones of the L.A. Honpa-Hongwanji Buddhist Temple at info [at] nishihongwanji-la.org or at 213-680-9130. Alison Minami is a writer and teacher in Los Angeles. She is also a member of the David Henry Hwang Writers' Institute and is working on a play. Alison Minami is a writer and teacher in Los Angeles. She is also a member of the David Henry Hwang Writers’ Institute and is working on a play.